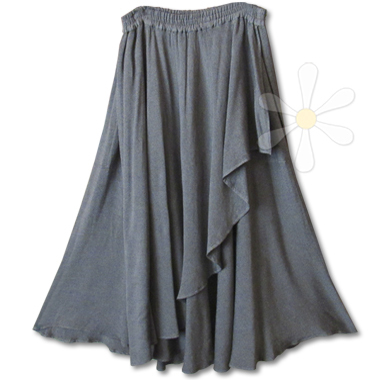 This wild fluttery gypsy skirt is nothing short of sensational... particularly in our rare and exclusive silver-gray weave! A full skirt with two long, cascading drapes that begin at the waist and fall in HEAVENLY individual flutters that offer the appeal of an asymmetrical handkerchief hem. And of course, it has a flattering wide elastic waist, stitched in three rows for comfort and stability, and handy side pockets... It's funky and feminine and 100% unique -- neither my words nor my photos can convey how OMIGOD gorgeous this is! For measurements and full details see the regular SHALAL page.